Well Needham got Ham. I just enjoyed a weekend with a stratified group including Occupational Therapists, Personal Trainers, Physical Therapists, Athletic Trainers, Student Physical Therapists and Strength Coaches all united as movement scientists. We spent time discussing diagnoses that reflect polyarticular chained movement patterns particular to asymmetrical acetabulofemoral joints and how they pertain to performance of athletes of all kinds. We had a thorough discussion of compensatory patterns and pathological tendencies associated with a left AIC patterned individual and developed treatment strategies to amend movement dysfunction findings from objective testing. Thank you @DanTorgersen and your team at Pure Performance Training for the use of your facility and all the accommodations therein--and Dan for your modeling skills. Thank you Tyler Tanaka for teaching us the inhibition strategy of "New Puppy Neutral", thanks Fotios Pantazis for the excellent dialogue throughout the course regarding specific intervention. 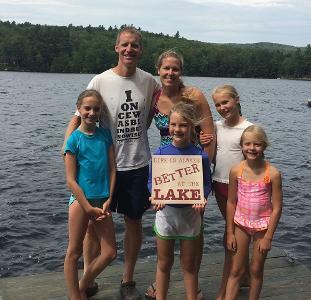 Samantha Russell again wins the dedicated student award for her long trip from AK, this time even further than Dallas! Stacey Lillios, Emily Mandara, Laura Lapolla and Brandon Mcconaughey-Freeman helped the class by asking a nice variety clinically relevant questions; thanks @JasonDBryne for showing up to DO WORK in the arena of myokinematics and keeping the discussion humorous. Though @JoshO_PRC was not present, there was amazing hair represented by @MUSCLE5Marinara, Pure Performance's own Michale Campanella. And, while also not present, thanks @mjmatc Michael Mullin who has helped further interest in PRI in the greater Northeast as much as anyone. Thanks Ian Funk for thoughtful contribution on PR principles and for having a sweet last name. Thanks Callie Effland, Lucia Sloan and Ricky Sirois for aiding learning by volunteering for lab demonstration. Lastly, thanks to the Needham hub who served as lab assistant, Donna Behr from Donna Behr Physical Therapy who is a good friend, great host and will soon be the featured interview here on the PRI website! Thoroughly enjoyed my time with some wicked smart movement scientists in the northeast! This past weekend confirmed once again that "PRI Integration for the Home" is ONE OF OUR BEST KEPT SECRETS! This was the first time we presented all of our new updated exercise techniques and let me just say they were very well received. The seated and standing techniques for securing a three dimentional Zone of Apposition were an awesome segway into the frontal plane abdominal wall techniques that secured the lower thorax so the upper thorax could counter rotate properly in both directions for dynamic gait and balanced ADL function. The left Serratus Anterior was employed together with the left Internal Oblique and Transverse Abdominus to realign the left half of the diaphragm so the patients could move freely in all three planes. The standing resisted hamstring techniques and the standing resisted adductor techniques were powerful exercises that literally all class attendees were able to feel working in the lab, which isn't always true. They were a very integrated compliment to the seated and recliner training techniques that help begin training these early stance gait muscles. 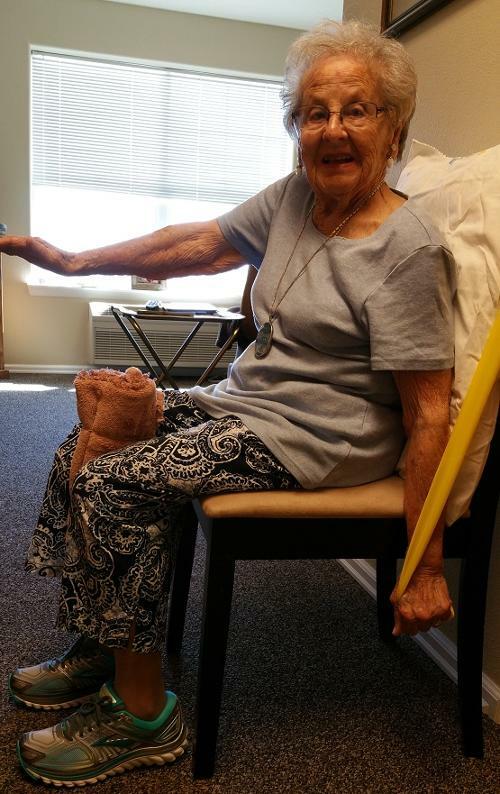 Eyes lit up as attendees realized that they could have success with gait and balance integration in standing with even the most frail geriatric patients using these techniques. 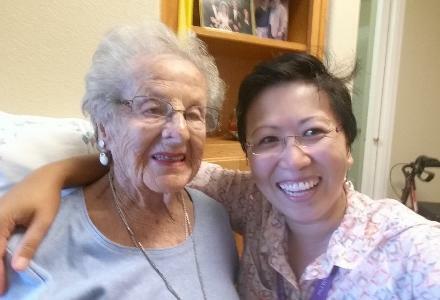 One of the star attendees in the class, Mellet Romero, PT, CLT sent me some follow up thoughts on the course and also some super cool photos of an 87 year old superstar named Barbara and a beautiful 96 year old named Vera that I just had to share. Ladies, I would have never known your ages, because you both look so much younger than your age would suggest. I just hope I could ever look as beautiful and happy as you ladies look when I'm your age! Your pictures put such a smile on my face I had to share them. Lincoln, Nebraska!! I came back to PRI Central to teach Myokinematic Restoration at the incredible new facility that is a marvel of architecture. With directors Jen Platt and Ron Hruska helping with my labs and Dan Houglum learning the ropes as a potential new instructor we took off on an exploratory venture of the Anterior Interior Chain! The group of attendees came from as far away as Tokyo, Japan and the experience was great!! The room was packed and the questions stacked. This was a third round with the new and improved version of Myokin and the feedback on the new format was excellent. Hold your breath because this one will finally make the concepts a bit easier to digest!! 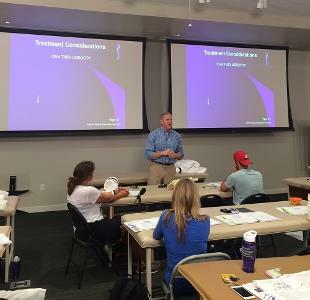 This past weekend Chris Gaines of Performance Gaines hosted Postural Respiration in Palo Alto, CA. I taught a diverse group of PT's, D.C.'s, athletic trainers, massage therapists and sports performance professionals. The attendees came from all backgrounds and facilities ranging from private practice, professional sports teams, universities, specialties in pediatrics and the military. This was a high performance group that really "brought it" with energy, attention and loads of questions! Mr. Chris Gaines did a great job hosting. Thank you Chris! Allen and I enjoyed our weekend in Philadelphia at the Maplezone Sports Institute with the staff from the Training Room PT, who hosted PRI Integration for Baseball. Thank you to Rob Rabena and Jon Herting for sharing such a great facility with us and for being such great hosts. It was great to get to spend some time with an old friend Navin Hettiarachchi, and to enjoy the evening with him and Allen after the first day of the course. We took a tour of the new Philadelphia Mormon Temple and we all agreed it was a very beautiful building. Near the end of our tour we got to take our picture next to Thorvaldsen's "Christus" statue. The original stands in Copenhagen Denmark, but the statue we saw was an impressive replica and made for a great picture. 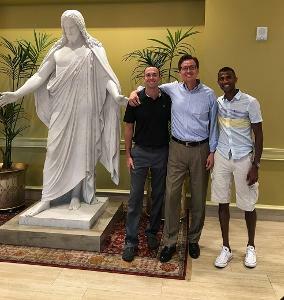 Allen and Navin could not get over the fact that Jesus was standing in left AFIR with a lot of right chest wall expansion. We laughed because the most memorable part of our tour was getting our picture taken with "Left AFIR Jesus". Notre Dame and the Catholics have Touchdown Jesus and BYU and the Mormons have Left AFIR Jesus. Too funny. The second day of the baseball course was focused mostly on testing and treatment. The biggest ah-ha's seemed to come during the Quadriped TS-ST Stability Test lab. The combination of assessing lateralization, pelvic elevation and proper weight shift across the pelvis while in AFIR with contralateral trunk rotation helped attendees recognize tri planar performance deficits across the lumbo-pelvic and thoraco-abdominal core on one side of the body compared to the other. 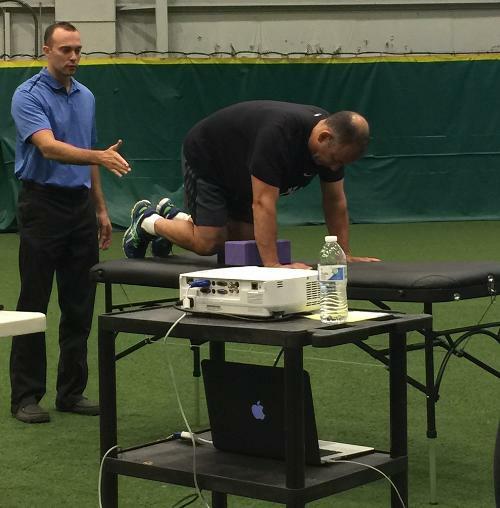 All in all, it was a great weekend of PRI principles, baseball throwing mechanics, tri-planer movement assessments and both treatment and training techniques for the baseball athlete. Thank you Philadelphia for all the fun memories. I was invited by Chris Poirier of Perform Better to present an introduction of PRI principles in Long Beach, CA for the 2016 Perform Better Functional Training Summit. This was the first time “PRI Nation” was represented at a Perform Bettter Summit on the West Coast. Among the presenters pictured were Dan John, Stu McGill, Chris Mohr, Todd Durkin, Jason Glass, Greg Rose, Brandon Marcello, Brian Nguyen, Martin Rooney, Mark Toomey, Josh Henkin, Ben Bruno and Alwyn Cosgrove and yours truly with the white polo shirt! (Center front). I was asked to join the Saturday afternoon panel for questions and answers and was able to provide a compelling lead-in for the Sunday morning lecture and hands on. Both hands on and lecture segments were extremely well attended and received. The buzz heard in the room from the attendees was “we have been waiting to hear about PRI, now we want to take courses and learn about PRI principles for rehab and performance especially managing human asymmetries and rotational performance!” Thanks much to Michael Mullin who provided support in this first time appearance and who speaks for Perform Better on a regular basis. And Thanks much to Chris Poirier for allowing me the opportunity to present! 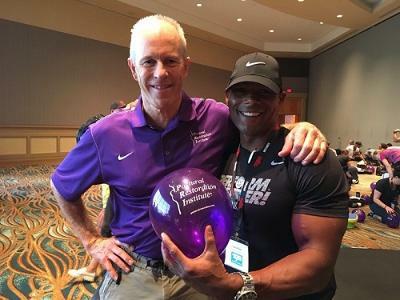 This past weekend, August 13-14, I was invited by Chris Poirier of Perform Better to present an introduction of PRI principles in Long Beach, CA for the 2016 Perform Better Functional Training Summit. This was the first time “PRI Nation” was represented on the West Coast. Among the presenters pictured were Dan John, Stu McGill, Chris Mohr, Todd Durkin, Jason Glass, Greg Rose, Brandon Marcello, Brian Nguyen, Martin Rooney, Mark Toomey, Josh Henkin, Ben Bruno and Alwyn Cosgrove and yours truly with the white polo shirt! (Center front). I was asked to join the Saturday afternoon panel for questions and answers and was able to provide a compelling lead-in for the Sunday morning lecture and hands on. Both hands on and lecture segments were extremely well attended and received. The buzz heard in the room from the attendees was “we have been waiting to hear about PRI, now we want to take courses and learn about PRI principles for rehab and performance especially managing human asymmetries and rotational performance!” Thanks much to Michael Mullin who provided support in this first time appearance and who speaks for Perform Better on a regular basis. And Thanks much to Chris Poirier for allowing me the opportunity to present! New Updates on PRT Testing and Application Deadlines! Another month has come and passed, which means the application deadline for our Postural Restoration Trained™(PRT) credentialing program is approaching quickly. We have some exciting news for our PRT credentialing program this year! Over the past few years, we have had several Athletic Trainers and Strength and Conditioning Coaches express an interest in completing the PRT credentialing program, but due to the schedule of the teams that they work with, they are unable to get away to attend testing in January. Therefore, we will begin offering a summer testing date which will take place once every 3 years, beginning in 2017. This next year, we will offer our traditional winter testing date on January 9-10th, and our summer testing date will take place on June 23-24th, 2017. PRT applications for the winter testing date are due on October 15th, 2016. Testing will take place on January 9-10th (following the Impingement & Instability course) at the Postural Restoration Institute in Lincoln, Nebraska. PRT applications for the summer testing date will be due on March 15, 2017. Testing will take place on June 23-24th at the Postural Restoration Institute in Lincoln, Nebraska. Please note that there will not be an Impingement & Instability course offered in conjunction with this testing date, therefore all applicants will need to take this required course elsewhere prior to testing. Postural Restoration Trained (PRT) is a credential available to Athletic Trainers (with Certification through the BOC), Athletic Therapists (with Certification through the CATA) and Strength and Conditioning Coaches (with CSCS Certification through the NSCA or SCCC Certification through the CSCCa). For more information on the course requirements and to download the application, CLICK HERE! If you are planning to apply for PRT, and have any questions, please email me!